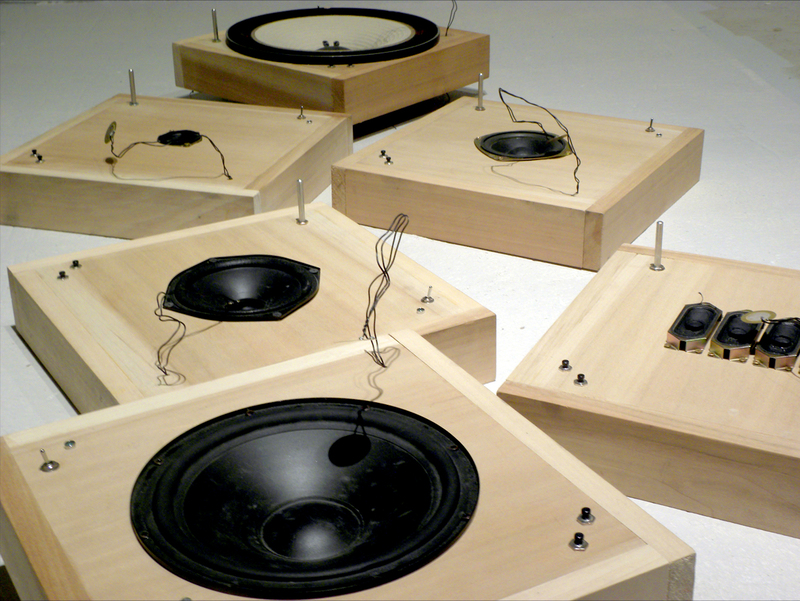 The speaker feedback instruments by Lesley Flanigan are a beautiful example of combining acoustic feedback and musical instruments. What makes the technology of these instruments exceptional is their use of so-called contact microphones (simple piezo-ceramic elements) instead of a microphone designed for picking up air pressure waves. These microphones can easily amplify the mechanical vibrations of objects such as the sound board of a piano, an apple box, or a coffee cooker, without picking up the sonic vibrations of the air surrounding these objects. 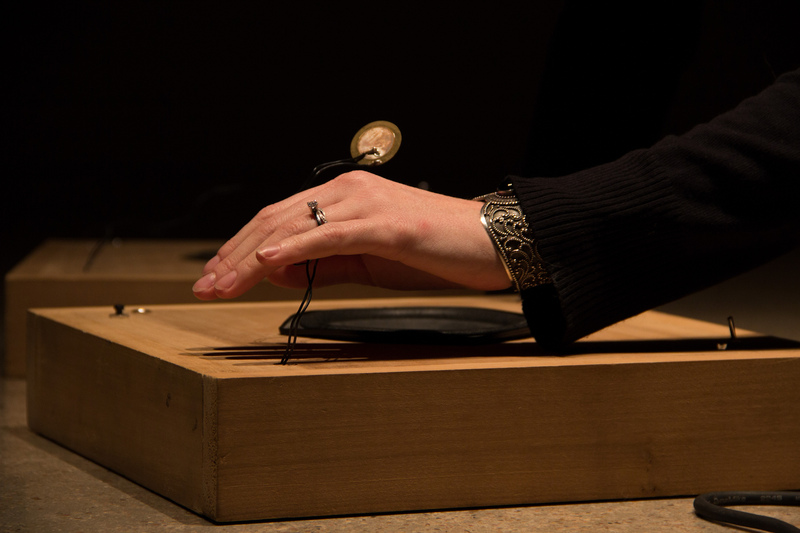 Or, simply speaking, when a contact microphone is connected to a table, and you are hitting the table and singing at the same time, the contact microphone will only amplify your voice. I had built a small amplifying circuit, and to test it, I grabbed a couple items that happened to be on my table: a raw speaker cone for the output and a piezo element (basically, a microphone) for the input. The speaker and piezo were touching each other, and a very complex, tonal noise of feedback occurred (Lesley Flanagan in an interview by Tyler Miller). 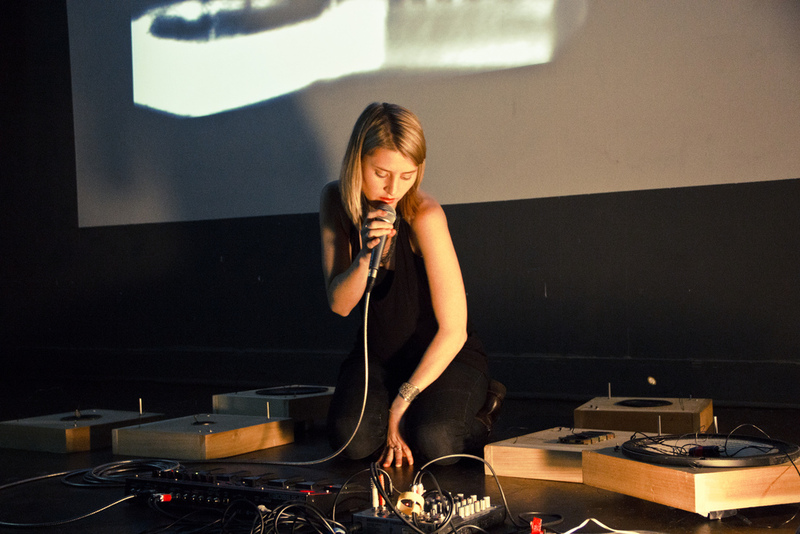 Since 2007 she has developed several of these speaker feedback instruments, and a speaker synth, which contains of five small different loudspeakers. Lesley told me that she changes the set ups depending on what she feels works best for the show she is doing (or how far she needs to travel! ), but she definitely has her favorites and tends to prefer playing with four at a time. Her instruments are made from old loudspeakers. She takes them out of devices, because she is interested not in finding a “perfect” loudspeaker but in discovering the specific voice each loudspeaker has. When she heard these speaker feedback instruments “singing”, it just felt very natural for her to add her voice to them. In her performance set-up she literally shares her microphone with them, moving it from her mouth to the speaker feedback instrument she wants to amplify through the PA system. For me, it is a special process to collect their raw sounds with a microphone, and amplify them on a large scale. I love the moment when what was once a crusty little noise becomes a booming, warm bass swell of dense tonality. 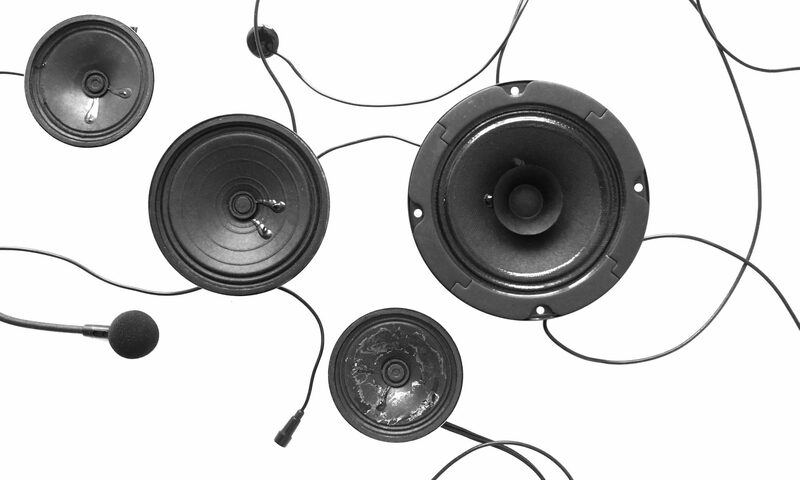 The sound itself never changed, but when amplified, its barely audible details are magnified, so we have the opportunity to hear it differently. By amplifying feedback tones, I’m trying to dig deeper and more introspectively into their sound (Lesley Flanagan in an interview by Rena Minegishi). As Lesley told me, this bigger amplification system also becomes a part of her instrumental set-up: “I use a PA for amplification, but often like moving back and forth between the large PA amplified sound and the ‘acoustic’ sound of the feedback instruments without any amplification.” During her performances, she develops different layers of feedback and voice, using a looping pedal for sampling sounds. Even though her performances are carefully prepared and rehearsed and she clearly knows her instruments very well, she is always also reacting to what happens at each specific moment: “I knew which speakers to work with and how to play each one to bring out elements of tonality, noise and rhythm I wanted to hear. The sampling and layering of their sounds were intentionally obvious, methodical and dense. But with all that said, I could have never predicted the exact sounds that would come out of the process. Many variables effect the feedback I work with, so no matter how much control I have planned, improvisation is always at the forefront” (Lesley Flanigan in an interview by Marc Weidenbaum).